← Earthquake hits Chicago area! Announcing: Mathematical Methods for Optical Physics and Engineering! There are plenty of “mathematical methods for physics” books out there — why did I feel the need to write another one? Well, I’ve been teaching a graduate course on mathematical methods in my department for five years — and actually taught one while still a grad student, too. My department focuses on optical science and engineering, so most of the students I get are (a) interested specifically in optics, and (b) often coming from an engineering background with much less abstract mathematics. Most mathematical methods for physics books are geared towards a general student of physics. This was a bit irksome for both me and the students while I taught the class, because optics requires a slightly different set of mathematical tools, in particular more emphasis on signal processing, integral transforms, and Green’s functions. Furthermore, math methods books typically draw from a wide variety of physical topics for exercises and examples. This is, in my opinion, sometimes futile — for most students, examples drawn from general relativity (or even statistical mechanics) are no better than abstract mathematical ones. Optics has become a significant field of science in its own right, with dedicated schools in Arizona, Rochester, Orlando, and Charlotte (my home base). Plenty of other departments of physics and engineering have a strong focus on optical science. I decided to take a stab at revising the curriculum for those optics-centric programs, and introduce my own mathematical methods book that would complement an optics undergraduate or graduate education. One of the biggest problems in teaching mathematics is making the connection between the math itself and the application of said math. To try and address this, (almost) every chapter begins with an introductory application for the technique to be studied, and ends with a more detailed study of how the math is used in solving an optical problem. I’ve tried to pick optical problems that don’t typically appear in other optics textbooks, for instance: the Talbot effect, Zernike polynomials and aberrations, optical vortices, X-ray crystallography, computed tomography, and even optical cloaking! I’ve also taken the unusual step of including essay questions in the exercises: read a given scientific paper and answer questions about its relation to the given mathematical topic. Though academic optics programs are becoming more common, I’m hoping the book will catch the attention of instructors teaching general math methods for physics courses. I’ve tried really hard to approach many of the traditional topics from a slightly different angle. I’m endeavoring to pass through a very narrow opening between “qualitative understanding” and “mathematical rigor” — I only include the rigor when it genuinely helps in applying the given methods. I’ve also tried to make this book a little more portable! Most math methods books are well over 1000 pages, but mine is targeted at 850. Obviously, this book won’t be for everybody, and probably won’t appeal to many of the readers of my blog, for instance those interested in non-technical explanations of optical phenomena! (This project was conceived long before I started a blog; my next writing project will be a more popular science/history book.) Hopefully everyone will benefit from my efforts, however — over the next few months, I’ll write non-technical descriptions of many of the optics examples that I’ve used in the book. I’ll also give more descriptions of the book and the process of finishing the book at time progresses. This entry was posted in Optics, Personal, Physics. Bookmark the permalink. 18 Responses to Announcing: Mathematical Methods for Optical Physics and Engineering! I’ll be sure to get myself a copy! Hopefully, I will meet the author someday so it’ll be signed… About the image, it looks like the dark spot of Arago yielded by a Laguerre-Gaussian beam [http://www.opticsinfobase.org/oe/abstract.cfm?id=141188]. 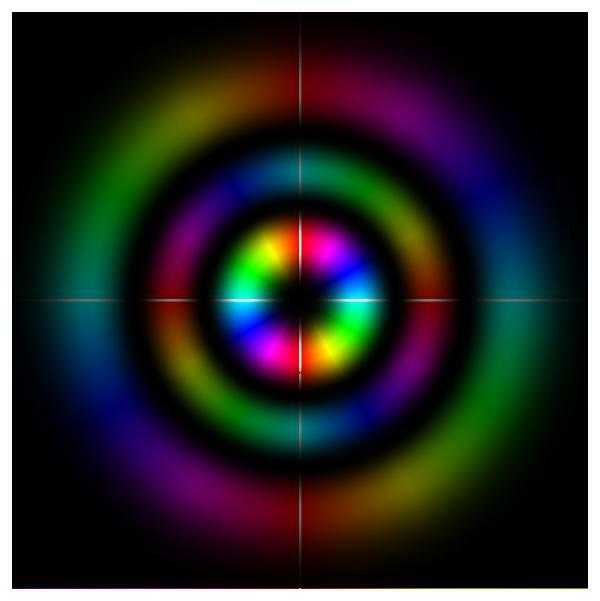 However, it’s the first time I see such a diffraction pattern with “rainbow” colours; since most depictions show it in grayscale. Nice picture! Was it computer generated or through experiment? IM: Very close guess! The ‘ring’ pattern is in fact the intensity profile of a Laguerre-Gauss 2-2 laser mode in the waist plane; the color pattern is the phase of that laser mode superimposed on intensity via Illustrator. From that description, I’m sure you can tell it was computer generated! Looking forward to meeting you in person at some point as well! Congratulations! I am delighted that you have given your time, talents, and experience to this book, that will surely benefit the optics community. I look forward to seeing ink on paper and buying myself a copy. Now can you please write a control systems text book for those of us who need to lock cavities, lasers, and VCOs? I certainly won’t discourage it! And your secret identify is officially revealed! At some point I’ll do an official “outing” of myself in a post. I’m still pseudo-pseudonymous! My local university, Erlangen, is the major centre for optics in Germany. They’re currently building the Max Planck Institute for Optics as an adjunct to the optics department, so I’ll see if I can get somebody to buy a copy or five for the library. Thanks! Hopefully lots of libraries will find it a useful book to have on hand. If your book explains hard to grasp concepts in optics even half as well as you do in your blog, it should be a great success. I look forward to getting my hands on a copy. Thanks! Hopefully the book will work that way; part of my motivation in starting the blog was to get more practice writing in a ‘coherent’ way. As I can’t read it will be impossible for me to find out your name. And even I could I would never reveal your name. You deserve it, this is the best blog i know of. When it comes to casting light on light you do cast a long light. The rainbow pattern is interesting. Combining physics, optics, mathematics is very interesting. Good luck.